This volume consists of a number of carefully-selected readings that represent a wide range of discussions and theorizing about ritual. The selection encompasses definitional questions, issues of interpretation, meaning, and function, and a roster of ethnographic and analytical topics, covering classic themes such as ancestor worship and sacrifice, initiation, gender, healing, social change, and shamanic practices, as well as recent critical and reconstructive theorizing on embodiment, performance, and performativity. In their Introduction to the volume, the Editors provide an overall survey and critical consideration of topics, incorporating insights from their own long-term field research and reflections on the readings included. 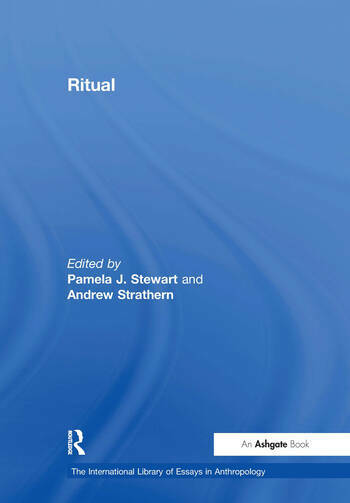 The Introduction and readings together provide a unique research tool for those interested in pursuing the study of ritual processes in depth, with the benefit of both historical and contemporary approaches. Contents: Introduction, Andrew Strathern and Pamela J. Stewart; Part I Definitions and Fundamentals: Variation and indexicality in the Maring ritual cycle, Roy A. Rappaport; Ritual symbols, syntax, and praxis: questions of cultural meaning and interpretation, Catherine Bell; Symbols, song, dance and features of articulation: is religion an extreme form of traditional authority?, Maurice Bloch; Embodiment and communication: 2 frames for the analysis of ritual, Andrew Strathern and Pamela J. Stewart. Part II Further Theoretical Categories and Considerations: The original significance of animal sacrifice, William Robertson Smith; The problem and its setting, Edmund R. Leach; Taboo, A.R. Radcliffe-Brown; The symbolic rite of 'giving thanks', Raymond Firth; Liminality and communitas, Victor W. Turner; Oracles support divine justice, Mary Douglas; Towards an integration of ethnography, history and the cognitive science of religion, Harvey Whitehouse; Against 'ritual': loosely structured thoughts on a loosely defined topic, Jack Goody; Toward a genealogy of the concept of ritual, Talal Asad; The body as geometer: cosmogonic practice, Pierre Bourdieu. Part III Topical Arenas and Examples: The rhetoric of transformation in ritual healing, Thomas J. Csordas; Shamanic performances: issues of performativity and comparison, Andrew Strathern and Pamela J. Stewart; Shamanic performance and cosmological praxis, Pamela J. Stewart and Andrew Strathern; Ritual communication and linguistic ideology: a reading and partial reformulation of Rappaport's theory of ritual, Joel Robbins; The Gardens of Omarakana: early work, Bronislaw Malinowski; The magical power of words, S.J. Tambiah; Puberty rites, women's naven, and initiation: women's rituals of transition in Abelam and Iatmul culture, Brigitta Hauser-SchÃ¤ublin; Female spirit cults as a window on gender relations in the Highlands of Papua New Guinea, Pamela J, Stewart and Andrew Strathern; Silent forms but natural symbols?, Gilbert Lewis; Power and placement in blood practices, Pamela J. Stewart and Andrew Strathern; Pietas in ancestor worship: the Henry Myers Lecture, 1960, Meyer Fortes; Cosmology, resources, and landscape: agencies of the dead and the living in Duna, Papua New Guinea, Pamela J. Stewart and Andrew Strathern; Israel, America, and the ancestors: narratives of spiritual warfare in a Pentecostal denomination in Solomon Islands, Jolene Marie Stritecky; Blood, fire, and word: Luo, Christian and Luo-Christian sacrifice, Parker Shipton; Sacrifice and social structure among the Kuranko, Michael Jackson; The meaning of sacrifice, Edward E. Evans-Pritchard; 'Cattle aren't killed for nothing': Christianity, conversion, and the enduring importance of prophets, Sharon Hutchinson; Ritual and social change: a Javanese example, Clifford Geertz; Name Index.